Nietzsche again?" Nietzsche professionally studied chorus in Greek tragedy, but never heard a wail quite like this. If the question does not sound forth in choral harmony, it is certainly uttered by a multitude of voices. The phenomenon of "Nietzsche again" gives rise to bewilderment, consternation, and exasperation on the part of the many who see his name everywhere and do not know why. In (dulcet or otherwise) antiphonal response, we may warble that the justification for attending to Nietzsche lies in his sheer influence, regardless of our judgment on the quality of his thought or on various particulars of Nietzsche interpretation. If we do not find him intellectually momentous, at least we might call him a momentous event in intellectual culture. It is true that attending to him primarily on account of his influence tends to inflate or, at least, perpetuate interest and to reinforce, and not simply to acknowledge, the status quo in Nietzshean investigations. Be that as it may, Nietzsche remains big business. We might expect anything to emerge from it, but presumably there yet remain innocent souls in our world who will be surprised to find a pious Nietzsche amongst its products. 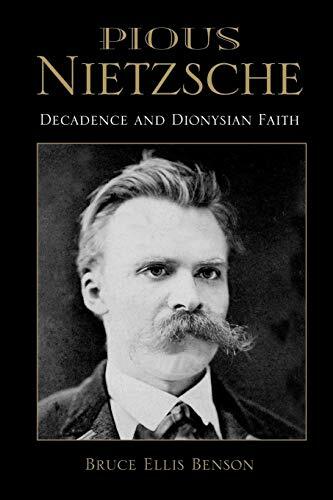 Still, Bruce Ellis Benson has produced him in Pious Nietzsche: Decadence and Dionysian Faith. That is tendentiously put, for Benson aspires not to forge an image of his subject in the furnace of intellectual construction but rather to describe the authentic Nietzsche. How does he do it?